The old-school method of cooking over an open-fire will never lose its charm. 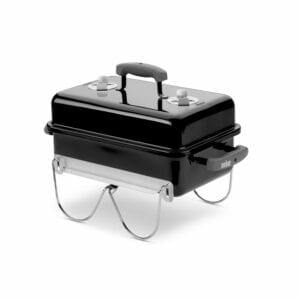 No matter how many advanced briquettes and propane grills circulate in the market, the Weber Go-Anywhere charcoal grill brings a flavor of its own to your grilled food. The Weber Go-Anywhere Grill is one of the most popular portable charcoal grills right now. Of course, a lot depends on the quality of the charcoal you use. But once that’s sorted, the grill can help you make succulent and flavorful pork ribs, tandoori chicken, salmon fillet and the best flavored seared meat cooked like a pro. The porcelain enameled body is resistant to rusting and other weather elements. It has 3 vent holes to increase the air flow along with 2 adjustable dampers. Only weighs in at 14.5 pounds. The pivoting legs lock makes transporting the grill a breeze. Charcoal grills have always been my go-to favorite. Some people prefer gas grills fearing the mess charcoal soot may create. But with my Weber grill, dealing with mess has hardly ever been an issue. The thing with gas grills is that they hardly enhance the flavor of the meat. Moreover, most portable propane grills are just too small. The WEBER GO-ANYWHERE has a cooking surface of 160 sq. inches which will easily prepare hamburgers, bacon, lamb rack, ribs or steaks for 4-5 people in a single grilling session. The grill heats up fairly quickly but bear in mind charcoal grills take a lot longer than gas grills to get to cooking temperature. The high heat retention capacity will give you a longer cooking time. Another benefit of cooking over charcoal is that it locks in the moisture and smoky flavor inside the grilled meat for enhanced taste. Just make sure to use quality charcoals to ensure the best possible outcome. Charcoal grills are extremely prone to rust. Once rust sets in it can be hard to stop the deterioration of the grill. The special enamel coating on the body of the grill helps to guard the Weber against rusting and therefore prolonging its life. The locking mechanism of the legs is another massive perk. With its help, the grill can be locked into position with ease, and small enough to fit in the tightest corners as well. The legs fold over the lid to hold it down for storage and moving. When the bbq is folded up it is small enough and light enough to be carried comfortably in 1 hand. If you want something instant, gas grills are always a better option but if the taste is your primary concern, nothing beats a charcoal grill. Just look at what some of these happy customers have to say about this Charcoal Grill/easyazon_link]. Apart from the locking mechanism of the pivoting legs, it is also equipped with built-in lid hangers. This comes in handy when you’re cooking out in the open, especially on a windy day. Using the hangers, you can place the lid at the side of the grill, this will effectively act as a shield against wind, keeping the fire stable and the heat can be controlled by using the dampers on the lid. Assembling the parts is also a breeze. Just follow the step-by-step guide provided in the manual and you’ll be good to go in a matter of minutes. The grill will take more time than gas grills to heat up properly (around half an hour). Plus, although it is portable, the legs are a little bit flimsy (although they do fold up over the lid to hold it on for storage and transportation). Despite some minor issues, the overall performance of Weber Go Anywhere Charcoal Grill is more than satisfactory. If you are someone like me who prioritizes taste over everything else, you should consider taking a look. The locking mechanism works just as good as claimed. The porcelain enamel coating will help to protect the grill for years to come and help in keeping the unit clean. As far as price goes, you get a great little grill for not a lot of money. This is a very affordable grill so why not check out the latest prices and see what the happy customers have to say here. Cooking surface area of 160 square inches. Lightweight, only weighs in at 14.5 pounds. The pivoting legs lock makes transporting a breeze. Takes around 1/2 an hour to heat up (most charcoal Bbq;s do). Size may be an issue for large families. Can’t be bothered with lighting the charcoal and waiting for it to heat up? Why not check out the Weber Go-Anywhere Gas BBQ Grill which has the same great portable features as the Charcoal version but without the hassle. Just hook up the gas and you will be cooking in minutes. Check it out on Amazon now.